There are a few things that we women desperately want in life. A body that looks good in a two-piece. …and, a good sea salt spray. I have tried them all. The expensive salon ones that leave my hair sticky or so stiff that I could probably rock a faux-hawk, the cheap ones from the drugstore that are literally like spraying water in my hair, and the oily ones that leave me looking more like I sprayed tanning oil on my head. Triple eww. I don’t scrunch. I can’t. Ain’t nobody got time for that. I need a spray-and-go product that works like a charm, every single time. I may have found it. Either that, or I slept perfectly last night to assist with these waves and I will never recreate this look on my own again. I’d rather not consider that option. From Ulta’s website: Texturize for stylishly undone looks. L’Oreal Advanced Hairstyle TXT IT Tousle Wave Spray is a high-performance sea-salt spray that creates carefree, undone waves for a sultry, (un)dressed look that lasts all day. Undo your uptight style for tousled and texturized waves. Matte texture. Reworkable. Heat Protection. How I Used It: I wanted my hair to air dry, because they’re not true “beachy waves” if you have to use a diffuser. I want my hair to look like I just came from the ocean, dang it, and allowed my hair to air-dry with the windows down on my way home. YOU KNOW THE LOOK. So, I towel-dried my hair, combed it out and then sprayed this generously on my roots and ends. Then, I took random sections all over my head, twisted them into little dreadlocks, did a few quick scrunching moves. Went about my business. Re-sprayed more a few minutes later. And went to bed. Total time = maybe 5 minutes. Why I Like It: All the other sprays I have tried that have partially worked only worked on my ends – my roots and the top half of my head remained stick-straight and boring. This stuff worked, literally, from the root down. Try it and tell me what you think! So you like this stuff??? I have wavy hair and I use bed head sea salt spray but it's not heavy enough for my Lb of hair! I may try! Try it! My hair isn't really super thick, but it's "heavy", if that makes sense. I'm not sure if this stuff would work on really thick, heavy hair – it feels super light – but I feel like it's the perfect amount of "saltiness" to create that genuine beachy look. Clearly, I'm no professional. Haha. This is my very uneducated opinion. I absolutely love this post. You are so right-on and uplifting!! 🙂 thanks! You look like you color treat your hair. Does it mess up the color at all? How often do you use it? My hair is lightened at the ends, but the spray does't change my color at all. 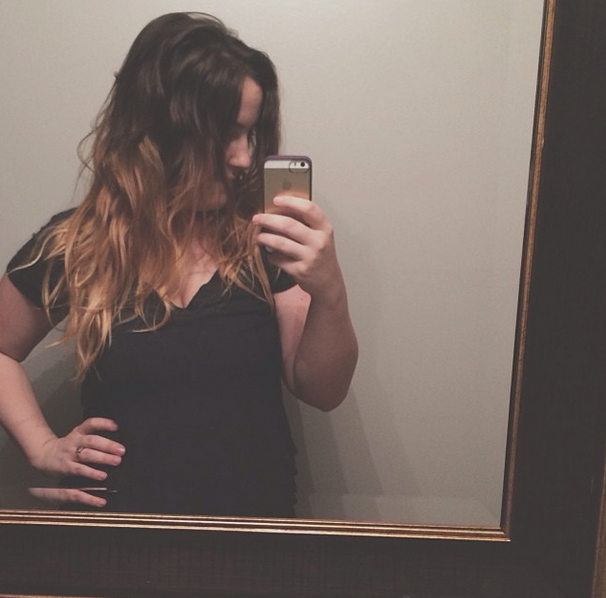 I only use it when I want beachy waves – maybe once a week at most? 🙂 I'm a mom, so my hair is in a topknot most days. Haha. I hope that helps!